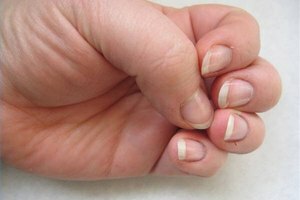 Remedy your brittle and discolored fungus-ridden nails before it’s too late. Nail fungus, also known as onychomycosis can affect both your hands and feet, permanently damage them and lead to infections in other areas of your body if you do not treat it. While oral medications and topical treatments are available, natural remedies such as vinegar, tea tree oil and lemon eucalyptus oil combined with preventive measures are equally effective at curing and preventing the recurrence of foot and hand fungus. According to Mayo Clinic, several studies have indicated that soaking the affected hands and feet in vinegar can prevent the growth of bacteria that cause fungal infections. Combine one part vinegar with two parts warm water and soak your hands and feet in the solution for at least 15 minutes. Rinse your hands and feet thoroughly and pat them dry with a towel. Use the vinegar solution daily until the fungal infection clears away. If you experience any skin irritation, avoid using the solution daily. Instead, use it twice a week. The oil from the leaves of lemon eucalyptus contains an antifungal property that is effective in treating hand and foot fungus. 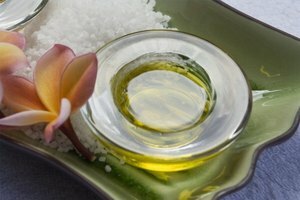 Combine equal amounts of lemon eucalyptus oil with camphor and menthol and apply directly to your affected hands and feet until the fungal infection subsides. Because Vicks VapoRub is formulated with lemon eucalyptus, camphor and menthol, you can use it as an alternative treatment to lemon eucalyptus oil. According to Web MD, using a 100 percent solution of tea tree oil to treat your hand and foot fungus is as effective as applying a 1 percent solution of clotrimazole. Gently rub a full-strength solution of tea tree oil on the areas of your hands and feet that are affected by the fungus, twice a day. Regular application of the oil will not only cure your fungal infection, but will also improve the appearance of your nails. As fungi proliferate in warm, damp areas, you should always keep your hands and feet dry to prevent the infection from spreading. Wipe your hands and feet completely with a dry towel after a bath or shower, and apply talcum powder to minimize moisture in this area. If you are prone to sweating, wear synthetic socks and change them often. Keep your nails short and trim them regularly by clipping straight across, so that your nails do not reach beyond the tip of your fingers or toes. National Center for Biotechnology Information: Comparison of Two Topical Preparations for the Treatment of Onychomycosis . . .
Will Listerine Cure Toenail Fungus?